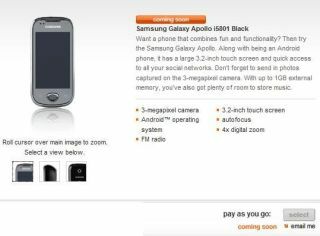 Samsung has finally taken the wraps off its new Android phone: the Samsung Galaxy Apollo i5801. Available on Orange in the UK, the new phone is aimed more towards the budget end of the market, with very different features to the high end Samsung Galaxy S.
Featuring a 3.2-inch WVGA LCD (presumably capacitive) screen, the new Samsung Android handset also packs a 3MP camera with autofocus, but sadly no LED flash. It can play back most video codecs, including DivX, although can only record video at 320x240 resolution at 15fps. However, the overlay has been improved by utilising TouchWiz 3.0, allowing social networks like Facebook, Twitter and MySpace to be aggregated into one zone: Samsung's Social Hub. Thankfully running Android 2.1, the phone also packs Wi-Fi, Bluetooth 2.1 and aGPS, so connection-wise you're fully stocked. There's also a high power 1500mAh battery, and while it's unwise to predict how a phone will work based on specs, this looks like a real cracker if the price is right – the fact it's coming on PAYG says it might be. Available today from Orange, and with more networks later in the year as the Apollo i5800 (what the extra one means is beyond us). However, Orange is still showing the phone as coming soon, so we'll have to wait to give you a UK price.